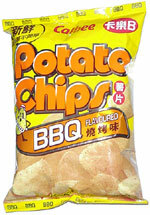 Taste test: These don't really have a barbecue taste. It's hard to place the taste, and it's not a bad taste by any means, but it really doesn't taste barbecuey. Smell test: Smells like a spice rack, not really like barbecue.